Sadly it's that time of the year, where the leaves change colour, the temperatures get colder and the pool has to be winterized. Yes unfortunately for all pool enthusiasts summer is over. We hope you had a wonderfull summer and that you really enjoyed your pool, but here at Campbell Pools the fun doesn't stop when snow covers the ground. As some of you may or may not know, Campbell Pools also offers a wide range of Hot Tubs and Spas, as well as all the accessories and chemicals you might need. 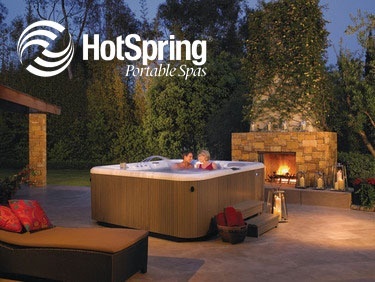 We have partenered up with two of the most reconized spa companies there is, Hot Spring Spas and Caldera Spas. These two brands are great and can accomadate anyone looking to enjoy some hot water relaxation after a very long day, but dont just take our word for it. If you click on the brand names above you will be transfered to their own blog where you can access their archives of knowledge as well as all the products they offer. Campbell Pools is alwasy trying to find new ways to better your customer experince in our stores. With all our show room displays you can really see the product before you make a purchase. Well when it comes to hot tubs we take it a little bit further. If you have been thinking of purchasing a hot tub but aren't sure if it is really for you or maybe you don't know what size would be good to accomodate your needs, well we have a solution to your problems. You can bring your swim suits and drop by our orleans location we have a few hot tubs that are just waiting for you to try them out. We know sometimes not everything goes to plan and there is a little hicup with the water in a hot tub, but you dont have to worry. During the winter months our water analysis labs are still running at full power and our staff will gladly help you our to get your water crystal clear because let's be honest, you use your spas to reduce your number of head aches not to create them. Maybe it's because we have chlorine running in our veins or maybe it's just because we want you to have the best experience when it comes to the products we sell, but we truly hope to see you come by for a visit this winter and who knows maybe we might see some new faces.